COME JOIN US FOR TWO FULL DAYS OF LEARNING DESIGNED WITH REAL CLASSROOMS, ENGAGEMENT, AND JOY IN MIND! Developing literate learners means developing literacy and language. It means classrooms filled with students who read, think, talk, and write together as they immerse in a process of making and conveying meaning. 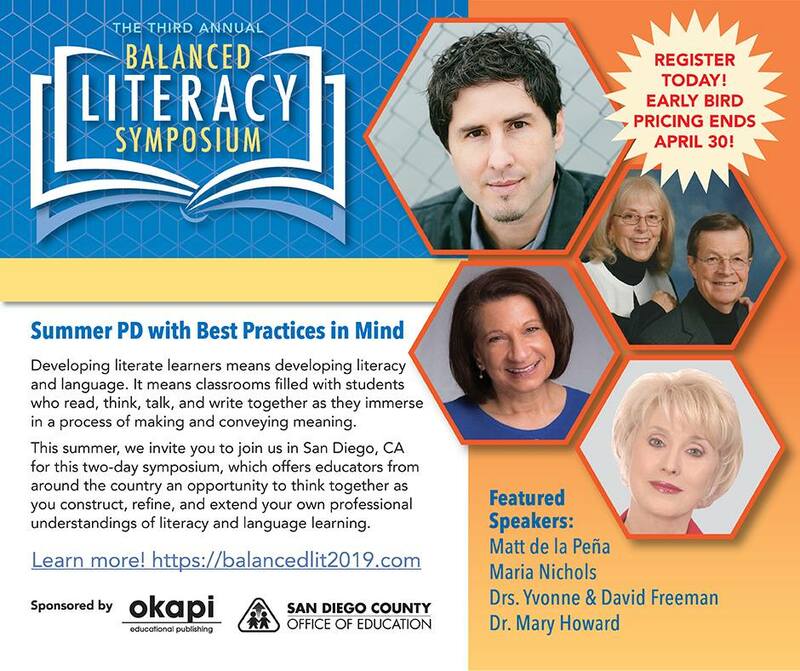 This two-day symposium offers educators from around the country an opportunity to think together as they construct, refine, and extend their own professional understandings of literacy and language learning. Developing classrooms alive with literacy and language invites all voices and perspectives to the conversation as we value and nurture the literate learners we want in our society. What becomes possible when we create and nurture environments where learners think and talk purposefully about books? What is the literacy work that matters for literate learners and what roles do balanced reading and writing approaches play in this learning? How does instruction focused on meaning align with phonics and spelling instruction in a balanced literacy classroom? How does formative assessment support quality literacy instruction in a time of high-stakes testing and standards? How does this work come together in Spanish-speaking classrooms, and in biliteracy and dual language classrooms? How can literacy leaders support classroom teachers to make the most of a learning environment? The teacher’s role is first to support students in developing the strategies and skills to read these texts. And second to teach the students to transfer their increasing knowledge and understanding to texts they will encounter across the curriculum. While the teacher may initially introduce the text and establish the focus, most of the reading the students do will be done independently or with the support of a partner. When the students meet with the teacher for their small group lesson, the teacher’s role is to encourage the students to talk about their thinking and prompt them to respond critically to the text. Students in the group are expected to engage in high level discussions with the teacher acting as a facilitator. A graphic organizer for students to use as they read provides a framework for the students to record and keep track of their thinking. The graphic organizer not only holds the students accountable for their independent work it is also a very useful a tool for the teacher to assess the strategies and skills that have been taught. 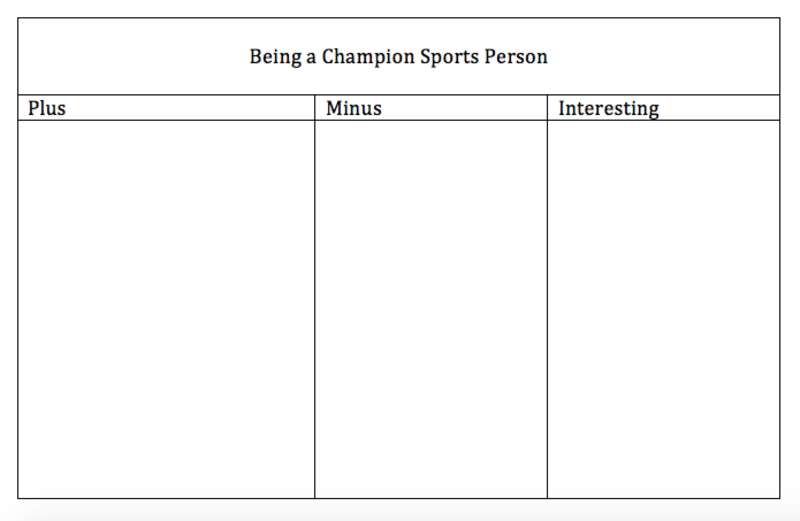 Below is an example of a graphic organizer that could be used for students to track their thinking when comparing and contrasting information within a text. Can students use information they have gathered to form their own opinions about a topic? Join literacy consultant Debra Crouch as she shares a big book with a San Diego Kindergarten class. This introductory session focuses on meaning and cognition of Which Pet is Best? Watch how Debra models her thinking about how the book works. Most conversation happens as whole-group discussion, until the turn-and-talk at the end of the book. This follow-up reading's focus is about deepening meaning of the book. Debra again models her thinking and invites students to turn-and-talk several times during their second reading of Which Pet is Best? Students join in reading the text aloud with the teacher as they choose. Debra uses a pointer to track the print by moving fluidly under the text, as all students in the class have one-to-one match established. In this installment with Debra Crouch, she and her students revisit the text to focus on vocabulary —specifically, describing words. Students discuss numerous describing words in the book. With each word discussed, Debra reads the sentence on the page to establish meaning, discusses meaning of the vocabulary word, and then rereads the sentence to put the word back into context. Students join in reading the text aloud with her as they choose. Before the video begins, Debra had students draw and write a response to the book: write about a pet you think is best. After collecting the students’ writing, Debra examined their writing to determine an appropriate teaching focus for word study. Debra determined that the word study focus would be to encourage students to ask themselves, “Does the word look right?” after they write a word. Several children had or could have used the word “because” in their writing. So this became the example word for their new strategy. This modeled writing experience gives children an opportunity to hear a writer decide what to write about, how to say the ideas to be written, and to notice strategies and conventions for getting an idea onto paper. Literacy consultant Debra Crouch writes about a topic the students had already written about: the best pet. After discussing the topic with students, Debra discusses different ways to begin the opinion piece and that the piece needs to include reasons to support thinking. She emphasizes rereading to check your writing and maintain meaning. Watch as the teacher leads a reading lesson with a small group of kindergarten children. The teacher invites each child to look at the pictures in the book and asks the child open questions about the story. Most of all, the teacher prompts the child to use their own words. She also asks the children questions starting with "which" and "where" to encourage the flow of communication. The teacher encourages the children to "add into the thinking", while supporting their ideas and concepts. As a result, the child displays a curious interest and communicates their thoughts about the book with the group. Join literacy consultant Debra Crouch as she and her guided reading group of 3rd grade students talk about paired texts AMAZING SALAMANDERS and SALAMANDER SURPRISE, Level N paired texts from the FLYING START TO LITERACY series. FLYING START is available from Okapi Educational Publishing.